All of our cards can be personalised with your own message and text inside and out. 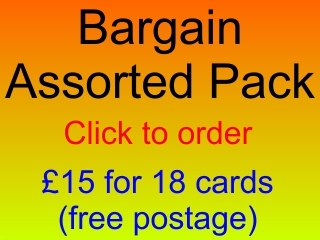 It costs an extra 50p per card. 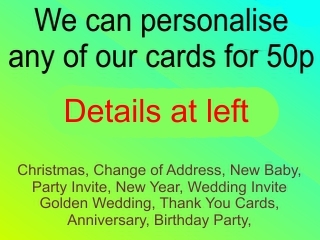 Just choose your cards and get in touch by visiting us, by email, post or phone explaining how you want your cards personalised. We also accept special orders, for example making cards to your own design. Again, contact us by any of the means below.